Justin and Joelle are the creative duo behind Fennec Design Co, a screen printing shop with a wide range of artistic inspiration, ranging from medical and botanical illustration to Art Nouveau. The couple has stumbled upon a wildly successful partnership, spanning five years and over 14,000 sales on Etsy. You’re partners in life and craft – which partnership came first? When we met, Justin had been running his own screen printing business for four years. He was doing a line of his own designs on top of printing and design for clients. At first our relationship was primarily romantic (although we did enjoy crafting and watching movies together on dates). Joelle had been drawing for years but hadn’t attempted to sell much of her work; Justin encouraged her to create some t-shirts and small pieces to post on Etsy. They sold well, but at that point both of us were selling under separate names and creating separate bodies of work, occasionally collaborating on a piece. We were both hesitant to merge our projects until we were sure things were going to work out on a personal level. We’d been together a little over 2 years when we decided to start releasing our collective work under the Fennec brand. Has it been challenging to work together since you’re both artists? Working together is simultaneously the greatest stress and the greatest joy of what we do! While we create a body of work together, we’ve made a definite decision to keep separate work spaces. We each have our own studios, and while we work together on artwork, we try to split many of the day to day work projects up. We only spend about 20% of our day together, which is probably to the great benefit of our work and love life. How is the product development split up between you? How do you split up the other, more mundane, tasks? Product development is the most collaborative aspect of our business. We usually start with the idea for a particular piece and we’ll each contribute portions of the illustration. This process is part of what gives much of our work the collage-type feel that we’re known for. Justin tends to take on the inventory and printing, while Joelle handles office work, mail, and customer service. Tell us about selling at Stash Collective – has it been helpful to have a retail presence? How does it fit into the business overall? Stash is one of a few retail venues that we wholesale to, but particularly close to our hearts because it’s local and we recently hosted our fall/winter launch party there. Retail has become an increasingly important part of our business over the past year, one that we are hoping to expand on to a greater degree in the future. We feel super lucky to be involved in a great community of artists, makers, and musicians in Harrisburg. It’s an area that is currently experiencing a huge arts resurgence, and we couldn’t be happier to be involved in the movement. We have a new studio opening this summer, several blocks from our house in a beautiful converted factory called The Millworks that will house a farm to table restaurant, studios, community arts, and gallery space. 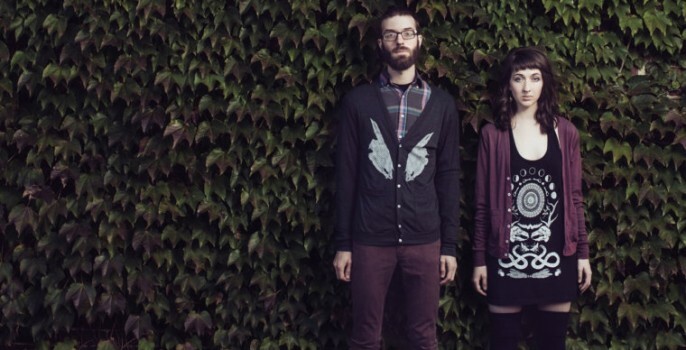 Fennec launched 40 new designs for the Fall/Winter line. What pushed you to do a seasonal line instead of adding items as you create them? Do you plan to do more of these launches? Honestly, we were curious to see what would happen. We both enjoy a challenge and were looking for new and inventive ways to grow; creating 40 pieces in a little under two months was nothing if not a growing experience. While it was a successful launch all around, I’m not sure if it’s the sort of plan we’ll be following in the future. With the immediacy that the internet provides, holding on to finished work just to release items in large bursts is financially burdensome and not necessarily ideal for drumming up interest in our products long term. Justin and Joelle, pick your favorite Fennec product – without discussing it with each other. No cheating! 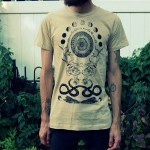 Justin: The beige rabbit skull t-shirt. 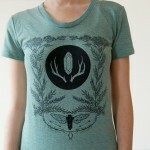 It’s the first t-shirt Joelle and I collaborated on, and it’s been by far our most popular design. I feel very sentimental about that design because it sort of planted the seed for what would eventually become our livelihoods. 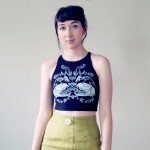 Joelle: Probably the cat and mouse botanical crop top. It’s one of our newer designs. I’m a total perfectionist when it comes to my work, so usually the piece that I’m most in love with at any given time is the one I haven’t had a chance to find flaws in yet. It keeps me busy. Fennec has nearly 14,000 sales in three years on Etsy – how did you do it? Do you do any advertising and marketing outside of Etsy? This is a toughy. We really don’t think that there is a secret formula to Etsy success and we’ll be the first to admit that we don’t necessarily do all of the things that you “should do” to be a successful shop. I think for us the focus has always been on the product, so things like SEO and photos have sometimes taken a back seat. We are very careful to provide prompt shipping and customer service though. It’s essential if you want repeat customers! We do use social media – Instagram, Facebook, and Tumblr especially. We found these were much more effective than traditional avenues for advertising. Mostly we like having the ability to interact with our customers on a personal level; they get to know us, and in turn we get to create products that will specifically appeal to them. You’ve said you’re not huge fans of Etsy’s recent policy changes – what implications do they have for your shop? What’s your stance on the site’s turbulent policies of late? We’d like to preface by saying that we’re huge fans of Etsy on the whole and we’re generally very happy with our experience both as sellers and buyers. At the same time, the recent decisions have made us a bit insecure about the future of the site. We understand that Etsy is a business, and that the number one goal for them will always be more sales, and greater growth. The recent manufacturing guideline change reflects the sorts of growing pains that the site is going through. Attempting to create a platform that allows for both growing large scale shops and single maker/OOAK handmade is a complicated task, and not one that we envy. I guess I would say that our stance is open minded and practical, if a bit skeptical. We hope that Etsy will continue to make decisions that will distinguish it from other selling platforms, to ensure that the integrity of the site as a place to buy handmade is maintained. Related to the last question, you’ve shopped around for another site to sell Fennec items. Did you settle on another venue? We decided to focus more on expanding our wholesale business this year. In many ways it’s a simpler process for us than selling orders direct to customer. Ultimately we’d like to re-launch the web store on our own domain, but we are in the process of re-working the site to make it more functional and user friendly. When it comes to online selling venues, we still think that Etsy is by far the best. Joelle makes jewelry in addition to the usual Fennec fare – will her jewelry creations ever make an appearance in the shop? Hopefully at some point! Joelle has currently maxed out her jewelry making capacity selling locally and in several boutiques. However, there’s a line of jewelry with a slightly higher price point in the works which will likely find its way onto Etsy in the near future. Honestly, we’ve been working pretty hard this month so we are looking forward to taking the evening off, cooking a warm meal together, and watching a movie in bed. Peer inside Fennec’s studio on their Instagram, or follow Fennec on Facebook for coupon codes and notifications about Justin and Joelle’s latest products. » Better Together, Etsy Spotlight » Better Together: Fennec Design Co.